After this gentleman/Aquaman-wannabe found himself on his third Treo in a year from water damage, he took drastic measures to protect his phone from the rage of the sea. Ripping apart his son's lunch bag, he found the answer had been there all along. 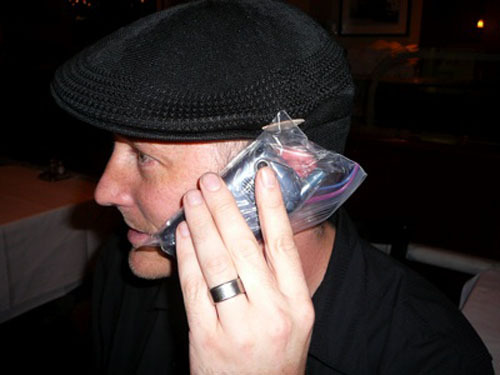 Rinsing peanut butter and jelly away with his child's tears, Alexander Rose "invented" the perfect waterproof Treo case. Oh yeah, except that it requires you to hold your Treo through a freakin' plastic bag.